Yesterday I went shopping, AGAIN ! haha. And I bought some cute items that I wanted to share. I bought the Olaz essentials Beauty fluid, because I kind of stopped wearing foundation on most days. The base I normally use underneed my foundation is kind of a day cream so when I don't apply foundation and the base my skin starts to feel really dry. And to use my night cream in the morning is not an option. So I'm going to try out the olaz essentials beauty fluid. I also bought, and showed, my new nail polish from Herome in the colour aalborg. I scored it on sale for only €2.50 ! And I bought another kiss nail art nailpolish set [€11.99]. This time in more must have colors like black, white and glitter. I will deff do a review about all my six nail art nail polishes from kiss. And I finally found the moustache necklace in an Accessorize store! I had seen this on the website a view months ago and have wanted it ever since. But I couldn't find it in the stores. 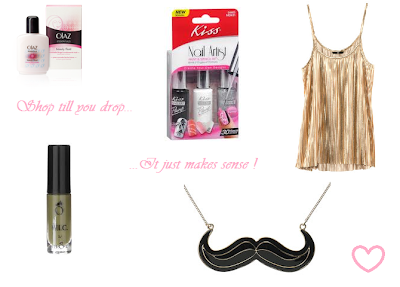 So I bought another moustache necklace on asos.com. But when I walked in Accessorize yesterday this necklace was one of the things I saw first. The necklace was: €9.90. I also went to H&M because I saw this gorgeous top for €15 in their magazine, and ofcourse I wanted it. But when I came in the H&M nearby it was already sold out [also on the website]. So I was really dissaponted. But than I saw this other cute golden top for €9.90 and I was like let's try this on. It looked cute especially with a pink tregging on. So I bought it !